One of the biggest threats to US security may now come from within Europe, US Homeland Security head Michael Chertoff has told the BBC. He said militant attacks and plots in Europe over recent years had made the US aware of the "real risk that Europe will become a platform for terrorists". 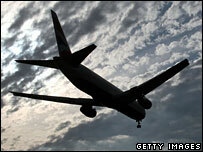 Mr Chertoff said it was likely security checks on travellers from Europe would be increased. But he said steps would be taken to ensure travel and trade were not hit. In the interview on the BBC's World News America, Mr Chertoff said he had seen "home-grown terrorism begin to rise in Europe". He cited deadly bomb attacks on Madrid and London, and a terror alert affecting UK-US flights in August 2006, as well as "people travelling from South Asia and the Middle East into Europe and carrying out attacks there". He said it was important to increase security checks on passengers from Europe - most of whom are currently able to enter the United States without being screened first because of a visa waiver programme. But Mr Chertoff added that immigration checks should not affect travel and trade - an important part of the US economy. As the fifth anniversary of the creation of his Homeland Security department approaches, Mr Chertoff said the US was now a safer place because of the security strategies that had been adopted. "Our ability to know who is coming across our borders, and to check them and to take their fingerprints now, is far better than it was five or six years ago," Mr Chertoff said. "We have deployed almost twice as many border patrols as we had five or six years ago. We've put up literally hundreds of miles of fencing and barriers. 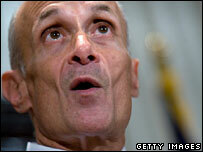 "All of these are very concrete steps forward that have made our security much better than it was," Mr Chertoff said.